PHOENIX (Sept. 5, 2018) - As the NFL preseason comes to an end, OH Predictive Insights (OHPI) turned to state residents to gather opinions on the Arizona Cardinals. 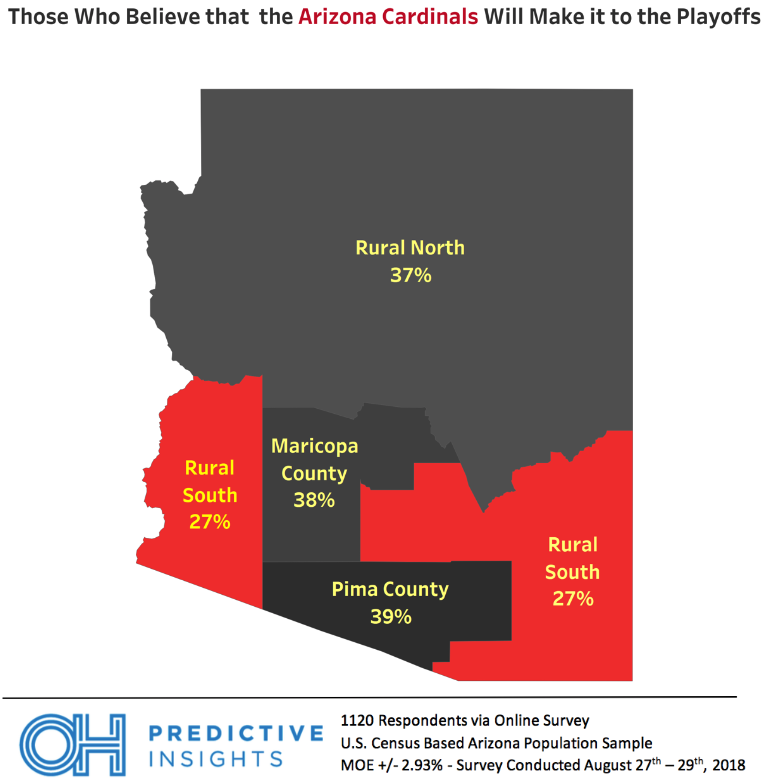 A new poll conducted by OHPI shows that Arizona residents are skeptical of the Cardinals’ success this season, with 61 percent of residents believing the Cardinals will not make it to the playoffs. OHPI asked Arizona residents a simple question: Do you believe the Arizona Cardinals will make the playoffs this season? Among those who are uncertain of the Cardinals’ success, 25 to 34-year-olds are the most doubtful, showing the highest percentage of doubt with 68 percent. 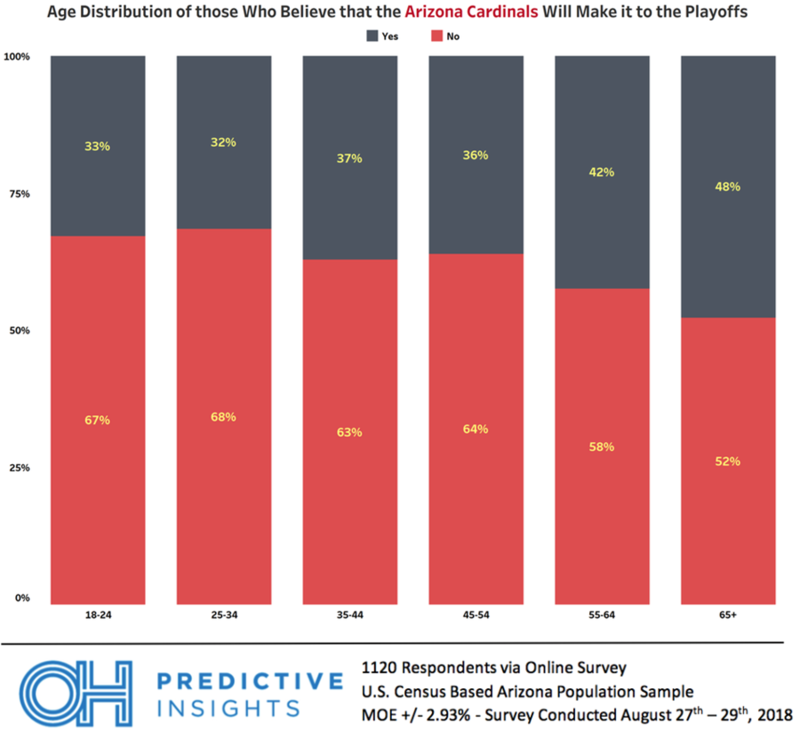 People 65 years and older show the most hope, with 48 percent believing the Cardinals will make it to the playoffs this season. Although the majority of Arizona is hesitant to think the Cardinals will make it to the playoffs, there is an even spread of people throughout the state who believe they can. The highest percentage of believers are found in Pima County with 39 percent, followed by Maricopa County with 38 percent, rural northern Arizona with 37 percent and rural southern Arizona with 27 percent. With the state’s opinion being so divided, the Cardinals will need extra support from their fans to propel them forward this season. Tune in as these perceived underdogs head into their first game of the season on Sunday, September 9, against the Washington Redskins. Methodology: This online survey was completed by OH Predictive Insights from August 27 to August 29, 2018, based on a U.S. Census based Arizona population sample. The sample size was 1120 completed surveys, with a MoE of ± 2.93%.